Even if you love your neighbors, sometimes you want a little privacy and separation between the yards. 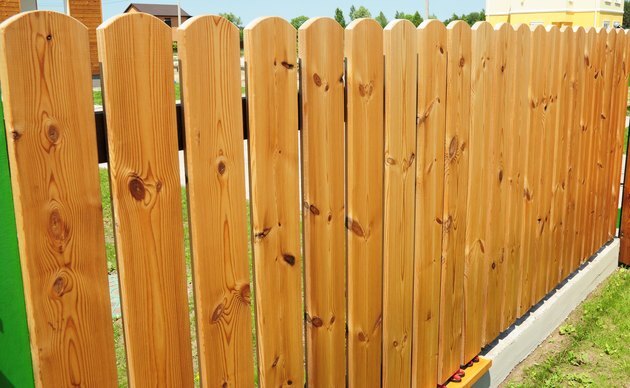 A wooden privacy fence is a popular and attractive way to create your own little private retreat, but it also requires some considerations to help you stay on good terms with your neighbor. Basic fence etiquette means you should put the finished side toward your neighbor. If you don't want to look at the "ugly" side of a standard wood privacy fence, consider other good neighbor fence styles that look attractive from both sides. Alternating the side on which the slats go creates a fence that looks the same on both sides. In this method, the fence slats are installed on alternating sides with a slight overlap, so you can't see right through to your neighbor's yard. Both neighbors get a finished look, and the gaps between the slats allow wind to blow through the fence to keep your backyard airy. Those gaps can also be a drawback if you're near the fence and look through at an angle since it's not a solid wall of fencing. Your neighbors could peek into your yard through the gaps if they wanted. Some people take a different approach to alternating the design by changing the way each panel or section of wood fencing gets installed. Imagine the standard privacy fence with one finished side and one unfinished or back side. This fence installation method alternates the direction each of those panels or sections go onto the fence. As you look at your fence, every other section will be the "good" side while the other sections will be the "bad" side. Your neighbor gets the same view. The benefit of this method is you share the good and the bad with your neighbor. One drawback is this method makes the fence look choppy. There's a very noticeable difference in appearance between the two sides, so you really notice it when your fence has both sides showing. A woven wood fence uses horizontal boards that go back and forth to create a basket-weave design. Vertical spacer boards stand at designated intervals between the fence posts. The horizontal fence boards go between the fence posts, but they go back and forth around the spacer boards, so they curve gently to create the woven look. The next board goes around each spacer board on the opposite side for a true basket-weave look. The pros of this method include an attractive look from both sides and a design that's a little more interesting than a standard fence. One drawback is that you need longer sections of boards since they have to weave around the spacers, so it may cost a little more in materials. The curving design can also put more stress on the wood than a fence design with straight boards. If you like the look of a traditional privacy fence but you don't want to stare at the unfinished side, consider a double-sided construction. This fence type uses the standard privacy fence method, but slats go on both sides using a sandwich method. Both neighbors get the nice finished view, and the fence has a little extra stability because of the double-sided construction. The drawback to this method is the cost since it takes twice the number of fence boards to create this design. Just choosing a neighbor-friendly fence design isn't always enough to keep everyone happy. Talk with your neighbor before you make any decisions so everyone is on the same page. Discuss your plans, and make sure there aren't any disagreements on the property line location or the proposed fence location. If you can't agree on the property line, contact the city or hire a surveyor to get an official ruling. Building the fence on your property instead of right on the property line cuts down on potential disputes or issues down the road. If you live in an area with a homeowners association, it's also a good idea to check the bylaws and make sure you're following all guidelines on fences.